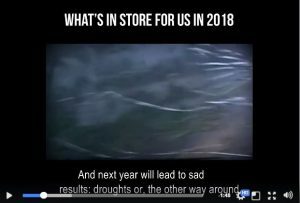 I see 2018 as a critical year in the development of mankind. I do hope this will be the year of awareness to our own evil and our correction towards goodness. Question: Do sports help health or are they a waste of time? Answer: My teacher Rabash exercised, Baal HaSulam loved sports but in a limited form, in order to keep the body in working condition. This is not sports, but physical exercise. Rabash learned to swim at the age of 65 and swam 400 strokes in the sea or pedaled 400 revolutions of motion on a bicycle. Remark: The cult of healthy lifestyle is flourishing now. An entire industry is developing around it. My Comment: First, people need something to do. Second, sports do help, so it is better that people do sports than something else. However, the fact is that in our egoism sports take exaggerated forms and Kabbalah does not welcome this. It welcomes exercises only to the extent that a person maintains himself in a normal physical form. Any gram of excess is harmful to physical and mental health. Everything must be very organic. Question: Why did you decide not to become ordained as a Rabbi even though without a doubt you could pass the appropriate tests? Answer: I carry out the required religious precepts. I do not have the opportunity to delve into them any deeper than necessary for their physical performance. I get the correct intentions for my actions from the wisdom of Kabbalah. Rav means a teacher, great, not necessarily in the practice of Judaism. My specialization is in the fundamentals of the existence of a person in this world achieving the goal of his existence. Question: Aren’t you building the same tower of Babel with which you will be able to approach the Creator? After all, as they say, the road to you know where is paved with good intentions. I am not a religious person, but it simply is not very wise to accuse our ancestors of stupidity, alleging they were building a tower to reach the skies or tried to imagine themselves as gods. You yourself state that our world is an animalistic world, so perhaps we will leave to the Creator to use the “good” whip so as not to attract any more whips to ourselves. I do not think that you will answer my question, but still there is hope. Answer: Continue to sort it out further.